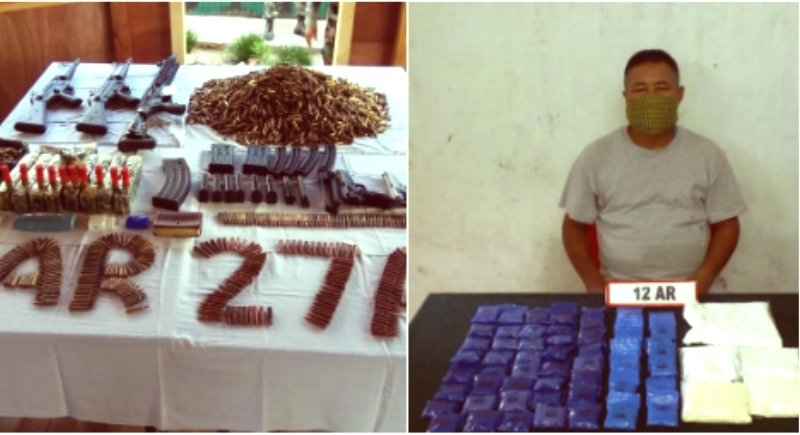 Manipur 22 May : In a major breakthrough Assam Rifles launched an operation and recovered huge quantities of arms, ammunition and explosives in a search operation. A press statement issued the last night from the Inspector General, Assam Rifles(South) said, one consignment of the weapons and ammunition including two GSG-5 German Rifles with four magazines, one Uzkon semi-automatic shotgun with three magazines, two 9 mm Beretta pistols with four magazines, one 9 mm Sigsauer pistol with two magazines, cortex, detonators and more than 6000 rounds of ammunition was found transported from Ukhrul to Imphal during the search operation. The statement further said, the recovery is a major success on part of Assam Rifles to thwart nefarious designs of the militant outfits.In another significant success, Assam Rifles apprehended yesterday one drug smuggler carrying Heroin and World is your tablets 1.70 Crores of rupees at Khudengthabi along the Imphal-Moreh Road under Moreh Police Station in Tengnoupal District. A press statement issued the last night from the Inspector General, Assam Rifles(South) said, during a frisking at Khudengthabi, the tablets were found in a four-wheeler coming from Moreh to Imphal. It further said, 230 grams of Heroin and 11000 numbers of World is Yours worth 1.70 crores of rupees were found hidden inside the toolkit bag of the driver of the vehicle. The apprehended person along with the recovered items has been handed over to Moreh Police Station for further investigation. The statement also said that Assam Rifles has seized contraband drugs worth 43 croresAssam Rifles recovers huge quantities of arms of rupees along National Highway 102.